For the educator, see Noah K. Davis. 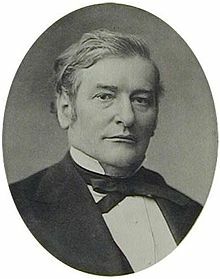 Noah Davis (September 10, 1818 Haverhill, Grafton County, New Hampshire – March 20, 1902 New York City) was an American lawyer and politician from New York. His family moved to Albion, New York, in 1825. He attended Lima Seminary in Buffalo, New York. Then he studied law in Lewiston, New York, was admitted to the bar in 1841, and practiced in Gainesville, New York, and Buffalo. He returned to Albion in February 1844, and practiced law in partnership with Sanford E. Church. In 1857, he was appointed to the New York Supreme Court (8th District) to fill the vacancy caused by the resignation of James Mullett, and was subsequently elected to two eight-year terms, but resigned in 1868 after his election to Congress. He was ex officio a judge of the New York Court of Appeals in 1865. Davis was elected as a Republican to the 41st United States Congress, and served from March 4, 1869, to July 15, 1870, when he resigned. Davis was appointed by President Ulysses S. Grant U.S. Attorney for the Southern District of New York and held that office from July 20, 1870, to December 31, 1872, when he resigned. He was buried at Mount Albion Cemetery in Albion. United States Congress. "Noah Davis (id: D000126)". Biographical Directory of the United States Congress. ^ Allen, Oliver E. (1993). The Tiger: The Rise and Fall of Tammany Hall. Addison-Wesley Publishing Company. pp. 138–139. ISBN 0-201-62463-X.